Is your journey towards weight loss frustrating you? Conventional tips for weight loss such as observing a healthy diet and regular exercise are not always effective. You should consider cryotherapy. It is simple, effective, and safe. Cryotherapy is a form of therapy that uses low temperatures. It is used in the treatment of chronic pain and inflammation, insomnia, mood disorders, and signs of ageing. The treatment started in 1978 in Japan as a way to deal with rheumatoid arthritis. Studies show that it may also be effective for weight loss. Cryotherapy chamber treatment exposes your body to extremely low temperatures which causes your skin temperature to drop to about ten degrees Celsius. The core body temperature does not change. Cryotherapy for weight loss can improve your metabolic rate which is necessary for weight loss. When your body is exposed to extremely low temperatures, it goes into survival mode which dramatically increases your metabolism rate. The best thing about it all is that one session lasts only three minutes. The treatment has benefits to all parts of the body. It is no surprise that the popularity of cryo spas is increasing so fast. During your cryo treatment, the brain sends signals to other parts of the body to pump blood to the core in an effort to warm up. The increased heat improves your metabolism rate. When the blood flows out through your body, it has plenty of advantages including renewal of body cells, pain and inflammation relief, and improved immunity. It is possible to burn up to 800 calories after one session. A cryo session which lasts about three minutes is, therefore, equal to a 45-minute run. Its effects are similar to those of exercising because it releases endorphins. The feel-good hormones improve your moods and the quality of your sleep. It helps to alleviate skin conditions and slows down the ageing process. If you are trying to lose weight fast, do not use cryotherapy alone. Use it along with regular exercise and observing a healthy diet. How Often Should You Have a Cryo Session? If you want to reap the maximum benefits from your cryotherapy, the secrets are consistency and patience. The ideal number of sessions is ten for every two to three weeks. If you wish, you can book a session every day. Get personalised sessions that address your unique needs. The procedure is safe and fairly simple. Unlike with an ice bath, cryotherapy chamber treatment does not have moisture so the cold weather cannot get into your skin by more than a half millimetre. You are free to leave the chamber whenever you like. Remember that even though studies prove that cryotherapy may be effective in weight loss, it is not magic. Use it along with other weight loss procedures and you will see the results faster. It may also help you with other issues such as insomnia and chronic pain. 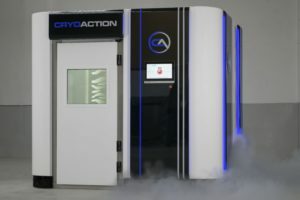 CryoAction have a wide range of cryotherapy chambers for hire for different needs such as athletes and spas throughout the UK. Their services are affordable and dependable and the members of staff are very respectful. Contact them for your cryotherapy chambers in the UK.